There is one movie I have to watch every Christmas season. If I don't watch it, my holiday season feels disastrously incomplete. Its a movie that feels a step up from the rest of the holiday fare, something that feels separate from the rest of the herd. It is a movie I have been watching with my family holiday after holiday for as long as I can remember. That is no suggestion either, when we didn't own the movie, we would hit up a video store around this time of year, just so we could rent it. I remember the video cassette had a trailer for "Gremlins 2" that I remember watching every single year. That movie is "Christmas Vacation." 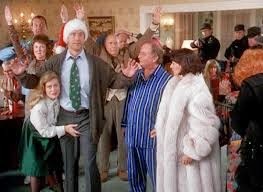 "Christmas Vacation" is the best movie of the vacation films. It is the best because I think its the only movie that had a meaningful plot. The rest of the series seemed like an excuse to get the Griswold family to an exotic location for a whole bunch of slapstick. I think the idea of holiday stress is something everybody can relate to, so it feels more personal than the rest of the film. But the film is not some kind of character study, the movie is all comedy. What is cool though is that the funny situations presented in this movie seem relatable and fun, not forced like so many other slapstick comedies. Chevy Chase, Beverly D'Angelo and Randy Quaid had become the main Griswolds over the years, but I think "Christmas Vacation" is the movie where they really flesh out their characters. We finally see why they are so special and what makes them particularly human. We see what makes Ellen and Sparky click as a couple and...dare I say it...we actually feel their love. Not bad for a goofy comedy, but that's the point. Adding John Galecki and Juliette Lewis as the Griswold children was a nice touch, but its really Chase, D'Angelo and Quaid who make this what it is.